Everybody smiles at Compton Verney. Don’t ask me why, they just do. The ladies who sold tickets were lovely. Walking from the carpark to the house we came across groups of happy families picnicking or just generally enjoying the magnificent Capability Brown landscape. A wedding reception was taking place in the grounds: more happy, smiley people. Twenty five years ago Compton Verney was a crumbling Georgian mansion when Sir Peter Moore (of Littlewoods Pools fame) funded its purchase, restoration and a quite eclectic art collection. Now it is home to the biggest collection of British Folk Art in the UK and one of the best European collections of Chinese art. Pots and lots of them form the core of the Chinese collection. Well not all pots, some are bronze vessels that would have held food for the afterlife. This is no rarefied, keep-your-children-quiet kind of a place. Displays are at child eye level as well as grown up height. At the centre of everything is a magnificent prancing Heavenly Horse, more than a metre a high. 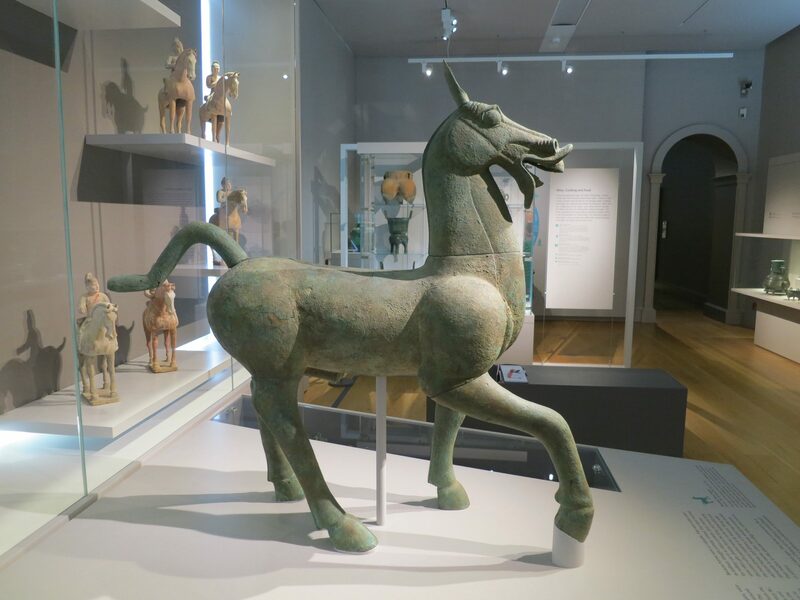 He was a funerary offering and would have pulled a high-status Chinese man in his chariot to the afterlife. Almost as much space is devoted to rooms full of comfy chairs, books and art materials for children and grown-ups to depict what they have seen. Folk Art was what drew me to Compton Verney. Light airy galleries at the top of the building are given over to a collection of shop signs, weather vanes, agricultural implements and domestic furniture. It might not sound very exciting but the shapes deployed in things meant to be used just seem to sing. In addition to the things are a collection of paintings done by untrained artists. 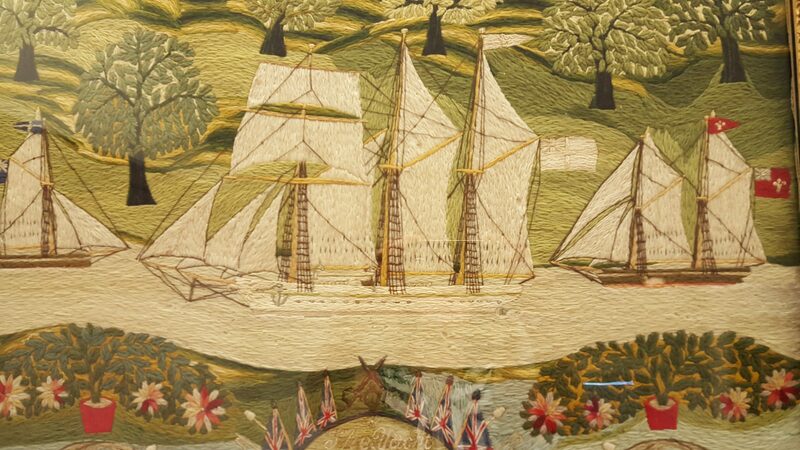 Here are enormous prize pigs, boats embroidered in coarse wool by sailors and busy urban streets all depicted by people with talent and time but no classical training. Compton Verney has grounds that cry out to be picnicked in. I foolishly didn’t pack one on this occasion and so we ate in café. When you visit make sure that sandwiches and rug are stowed away in the car before you set off. We stayed in the YHA Stratford upon Avon during our visit and visited all things Shakespearian in Stratford. Have always wanted to visit. I need to do a Grand Tour around the Uk and see all the museums I have promised myself that I would see. Thanks for sharing. In my former life I travelled around the UK for work and snuck in a few visits. Can recommend the Bowes at Barnard Castle! 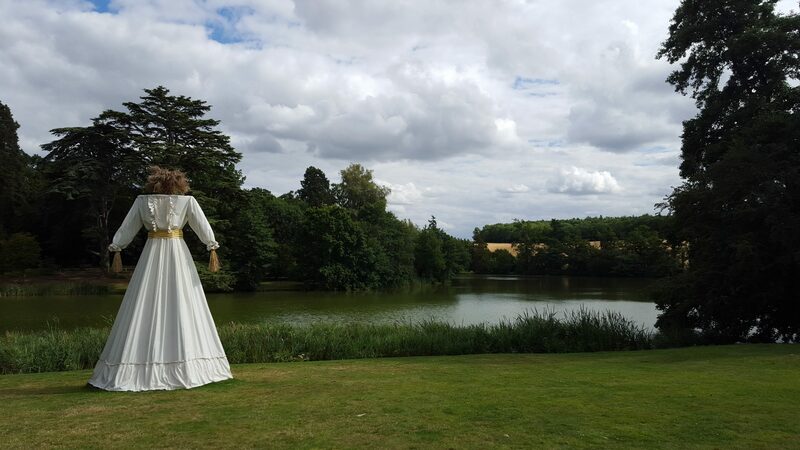 I adore Compton Verney! Looking forward to the Fifties Exhibition starting July 2016 ….